Description: SR-71 research pilot Ed Schneider is pictured here in front of an SR-71 Blackbird on the ramp at the Dryden Flight Research Center, Edwards, California. 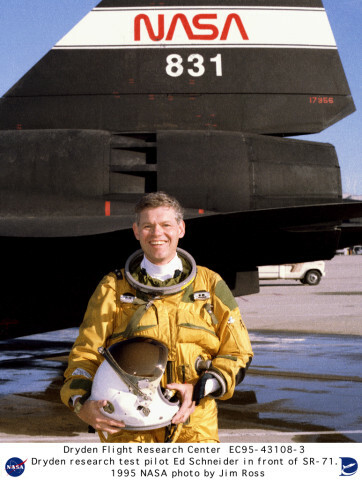 Schneider became a NASA research pilot at Dryden in 1983. He retired as a NASA research pilot in September 2000. Data from the SR-71 program carried out by NASA could aid designers of future supersonic aircraft and propulsion systems. Description: Two SR-71 aircraft have been used by NASA as testbeds for high-speed and high-altitude aeronautical research. The aircraft, an SR-71A and an SR-71B pilot trainer aircraft, have been based here at NASA's Dryden Flight Research Center, Edwards, California. They were transferred to NASA after the U.S. Air Force program was cancelled.